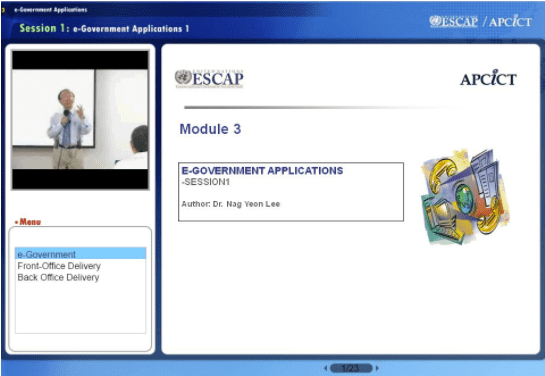 The module provides an overview of e-government, including key elements and concepts, principles and types of applications. It discusses how an e-government system is built by providing detailed analyses of exemplary systems and identifying design considerations. Discuss important success factors as well as barriers to achieving success in e-Government services. Analyze the factors that lead to success or failure of specific e-Government applications. Nag Yeon Lee is currently an IT consultant in e-government and IT advisor for many organizations including Hyundai Information Technology where he was Senior Vice President for over 10 years. He has extensive experience in international business development with IT solutions. He was Vice Chairman of the Korea Ultra Wide Band Forum where he worked on issues related to wireless communication such as WiFi, Wimedia, WiMax and Wibro. He was also an instructor for the Korea IT Learning Program where he was involved in the development of modules for overseas high-level IT experts on: 1) e-Government: implementation strategy, applications (G2B, G2C, national finance system, tax system, security system, e-health, e-learning); and 2) ISP, business process re-engineering and change management. He received a Special Achievement Award from the Prime Minister of the Republic of Korea in 2002.